Whether modern or vintage, these homes all have one thing in common; They are absolutely stunning! This home was built in 2003 and is an AMAZING home in the renowned neighborhood of Otter Pond. Although it has many modern, luxurious touches, we love the blend with the traditional. The open floorplan and high-end cabinetry, granite and floor to ceiling windows all give it a very modern home. This home was also named the energy efficient house of the year! This home is newly built and located in The Bridges Golf Community. The granite countertops throughout the kitchen and bathrooms give it a modern feel, while the hardwood floors and , hardwood floors and knotty wood door give it a rustic charm. We absolutely love this stunning home! You enter into the home through solid, wood “castle style” doors. There are 3 stone finished fireplaces and the master has a sitting area for reading, relaxing or watching TV. This home embodies comfort and relaxation. This home is absolutely AMAZING and an opportunity not to miss! 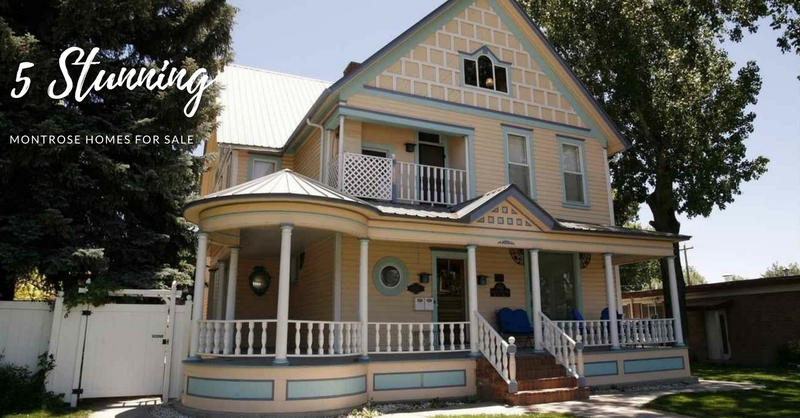 This landmark Victorian home in downtown Montrose features 6 bedrooms, a spacious living and dining area, built-in bar, stained glass, ornate wood trim, French doors, and so much more! The Loft Apartment on the third level is complete with bedroom, bath, kitchen, living room & wet bar plus a separate outside entrance to the rear. The perimeter of the Home features a huge front porch, private patios on either side plus lush vegetation and landscaping. This home embodies warmth and luxury. It was built in 2006 and has 5 bedrooms and 4 full bathrooms in addition to additional spaces for an office, home theater, and exercise room! This home sits on .87 beautifully landscaped irrigated acres.